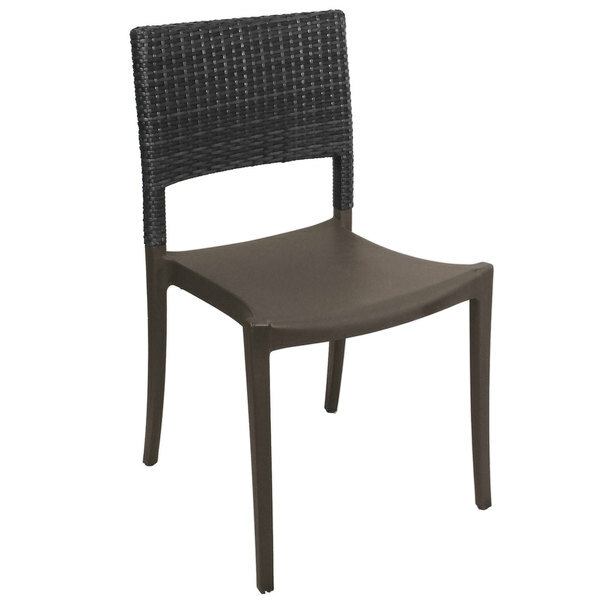 Add comfort and style to your dining establishment with this Grosfillex US925002 / US985002 Java charcoal resin sidechair! This chair features a fiberglass-reinforced resin frame that is lightweight, yet durable for long-lasting use. Its contoured backrest ensures optimal back support, while its classic wicker design offers a distinct visual appeal to any commercial environment. Plus, an armless design allows guests to take a seat from three different directions, making it easier to sit down and adjust to their comfort level. A great addition to your outdoor patio or deck, this chair is UV resistant to ensure its attractive charcoal color won't fade from exposure to direct sunlight. Plus, its impressive 300 lb. capacity ensures years of reliable use in your establishment. Add this sturdy, stylish chair to your restaurant, bistro, or bar and ensure guests comfortably enjoy their dining experience!